I have joined AOK, a social game for good that recognizes players for posting Acts and Observations of Kindness (AOKs) happening in the real world. It’s no avatar game or complicated – just AOKers increasing their own and society’s collective mindfulness! For every AOK you post, you get points. All of the points will convert in real dollars that will go to real world charities and relief efforts. I have started a Networlding campaign where you can post an AOK using the flashtag “ *networlding “. If you’d like to see some of my own Acts & Observations, go here. Some “AOKs” might include talking up a wallflower, exchanging contact information at an event and making business referrals. Go to www.aok.tv to get started! I am encouraging you to post 3 times for the month of December and the points for this time period will go to Pacer’s Center Teens against Bullying. 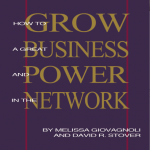 ﻿ If you post 3 times this month, you will win a free book: How to Grow a Great Business and Power Network by David Stover and I. We also will choose among participants to be featured on the Networlding Blog! It’s a great way to contribute in the holiday season in the spirit of Networlding.